In the early 1980s, one of the hottest young comic artists on the scene was Frank Miller, who beginning with issue no. 158 had taken over Marvel’s Daredevil. Blind lawyer Matt Murdock by day, radar-enhanced superhero by night, Daredevil is a prime example of the ability of a strong artistic team and bold direction to lift B-list characters to popularity and make them relevant. With Miller both writing and penciling, and inking duties given to Klaus Janson (with whom Miller would have a long professional relationship), Daredevil went from an also-ran to a must-read, a moody, complex urban gothic melodrama, the lead character closer to Batman than to Spider-Man (to whom he had usually been compared). Most Marvel comics were centered in New York City, and for Daredevil’s rough Hell’s Kitchen neighborhood Miller provided a gritty, ground-level texture, drawing from his own experience as a newcomer to the city in the Taxi Driver era (compare these depictions of New York to the descriptions in Eric Van Lustbader’s contemporaneous novel The Ninja), full of local color and making the city backdrop an essential part of the atmosphere. Miller shifted the viewpoint between different characters, framed the action in visually striking ways, and tightened the screws on Murdock/Daredevil to make his choices more dramatic and compelling. Ultimately he would put his own stamp on all future depictions of the character. In doing so he showed the influence of Will Eisner and Neal Adams, among others, but he was also vocal in interviews about his enthusiasm for the classic manga Lone Wolf and Cub by Kazuo Koike and Goseki Kojima, at a time when Japanese comics were barely present in the American market. His interest in Japanese culture also found its way into the pages of Daredevil, which became one of the key avenues for the influx of ninjas into American comics. The Elektra arc makes for an interesting study of the ways ninja lore and traditional martial arts storylines could be blended with larger-than-life superhero concepts. Indeed, in its more fantastical form the ninja movie is already a kind of superhero tale, with ninjas and martial arts masters engaging in superhuman acrobatics and demonstrating seemingly magical powers. Daredevil’s super-sensitive hearing is well-established, able to detect people hiding just by listening for their heartbeat; the ninja, able to slow his heartbeat and go for long stretches without breathing, remaining perfectly still, makes for a formidable challenge. And Miller clearly enjoys choreographing fight scenes that pit Daredevil’s acrobatic fighting style against the ninjas’, using his billy club much as the ninjas use bo, bokken, or nunchaku. It’s a good fit. As I mentioned in discussion of Enter the Ninja, ninja movies rely on visual cues such as different-colored uniforms to distinguish combatants; in real life, the ninja’s need for stealth would rule out bright and flashy colors (and forget about Elektra’s long, flowing hair), but in fantasy the ninja gi is a “second skin,” just like a superhero’s costume, relaying something about the ninja’s character and narrative function. Ordinary rank-and-file ninjas (genin, or “agents”) mostly get plain black uniforms with little to distinguish them as individuals; important characters get different colors, or more elaborate armor, or at least an insignia. This is true in the comics as well as in the movies: Elektra, the former ninja, wears a red leotard and head scarf (when she’s not in disguise, that is). It is essentially her hero costume, putting her on the same narrative level as Daredevil, the villain Bullseye, or the other superpowered main characters. In addition to being visually distinctive, her red scarf connects to an early form of Matt Murdock’s Daredevil mask he wears in the flashback (and of course both their costumes are red); whether they like it or not, they are connected, their destinies intertwined. Finally, Elektra has a signature weapon, a pair of sai (swords with forked blades), although like all ninjas she is skilled with many different weapons. Epilogue: Just as Kurt Cobain said that he knew he had made it when “Weird Al” Yankovic parodied one of his songs, so the popularity of Frank Miller’s approach can be confirmed by an unlikely spoof that has turned out to be as enduring as Elektra. In 1984, Kevin Eastman and Peter Laird produced a self-published 40-page black and white comic book. They dedicated it to their heroes, Jack Kirby and Frank Miller, and riffed affectionately on Miller’s style and themes. Miller’s ninjas were part of the “hand,” so Eastman’s and Laird’s ninja villains were the “Foot clan.” Their four heroes narrated their adventures in grim, self-serious monologues, playing an outlandishly cartoony premise completely straight; one of them even wielded Elektra’s weapons of choice, a pair of sai. Eastman and Laird hoped that their modest effort might sell a few copies and entertain their friends. Little did they know that their creation would become a smash hit in the indie comics world, inspiring their own knock-offs, and would even be adapted into multiple television cartoon series and feature films. The franchise they gave birth to is still known by the same title they gave their initial 40-page book: Teenage Mutant Ninja Turtles. And, as Paul Harvey says, now you know the rest of the story. This concludes Ninjanuary and my biweekly exploration of the shadowy world of the ninja (as reflected in pop culture, at least). Thanks for reading and following along, and if you haven’t read my previous installments you can click on the “Ninjanuary” tag in the column next to this article to see all of them. I’ve got a few things planned for the spring, so check back here or follow me on Twitter for updates, but farewell for now, or should I say, Sayonara? I’ve heard Tom King’s name a lot lately, in connection with projects like The Vision and Mister Miracle; according to one acquaintance, King is the best writer currently active in comics. But I hadn’t gotten around to reading much of his work yet. I don’t read everything, so until reading “Ain’t It a Drag?” in Kamandi Challenge no. 9, I knew King mainly by his reputation. On the basis of this one story, I have become a believer. The plot of “Ain’t It a Drag?” is simple, almost schematically so, and is a departure in style and format from the previous chapters of this ongoing serial. 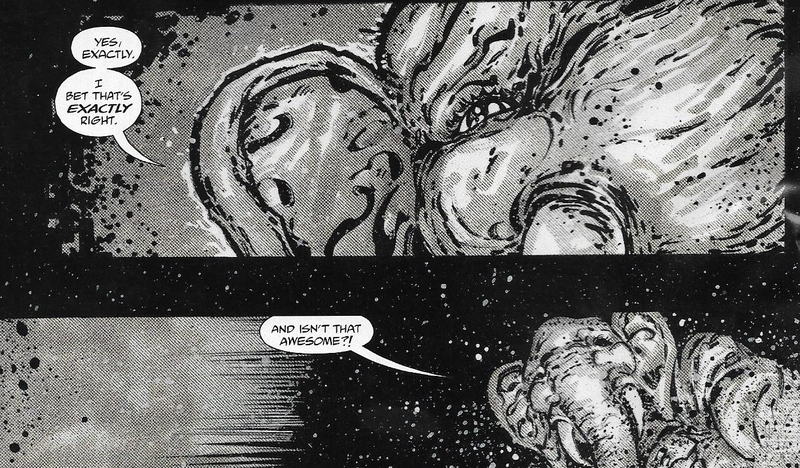 The detailed, monochromatic art by Kevin Eastman (who has plenty of experience with talking animals as co-creator of the Teenage Mutant Ninja Turtles) and Freddie Williams II combines with King’s dialogue to create a story that unfolds elegantly, like a fable. In broad strokes it could take place anywhere or to almost any character, but in its details it shows off what makes Kamandi and his world distinctive. 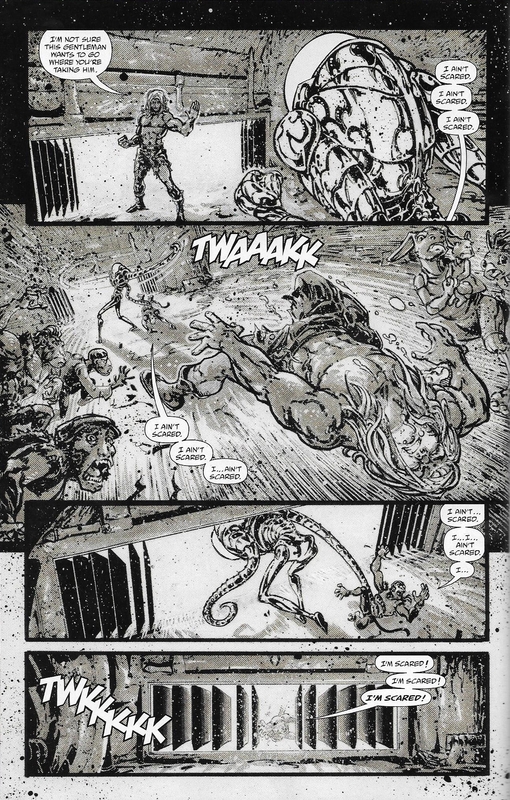 Kamandi awakens in an enclosed, cave-like room with a number of other people, or rather the anthropomorphized animals who are Earth A.D.’s primary inhabitants. Kamandi has only a vague memory of the sea serpent that menaced him at the end of last issue, but at some point he was captured and taken to this place. Periodically, over a period of months, a door opens and an alien-looking robot (or something) enters, grabbing one inmate and dragging them away: where or to what fate is unknown, but everyone has varying opinions. Herbert, a friendly elephant, is optimistic and describes everything as “awesome.” Maybe the visitor is taking people away to somewhere awesome, and it’s so great nobody wants to come back? Could that be why no one has returned to describe it? Other animals react in their own way, in fear or acceptance. A mother kangaroo pleads “Not my baby!” every time the dragging begins, until she is herself taken. A small bird spends time writing a story about the cave and what might lie beyond it. Kamandi, for his part, occupies himself building his strength and making plans to attack the robot, each time failing to even slow it down. Ultimately, after everyone else is gone, he too is taken, and the cave is empty except for the slab-like bench that was the cave’s only furniture, now clearly a symbolic coffin. The most obvious interpretation of this story is to regard the door as death, the fate to which all of us are eventually dragged and from which no one has returned to describe the experience. No amount of strength, preparation, or pleading can put it off when it’s your time, but it is ultimately part of the rhythm of life, a fact to be accepted as best one can. Herbert’s faith in something “awesome” beyond the door is a comforting religious belief. Others live in denial, escaping into nostalgia or fantasy, or maintaining a “stiff upper lip.” One inmate, a moss-covered turtle, has seen generations come and go in the cave, and decides that it is his time; he steps forward to meet his fate, only to be ignored (although he is later gone, so I guess he eventually was taken). How much easier it must be to make one’s peace with the end when friends and family are already gone, no works left undone. Of course, this is still part of an ongoing narrative: Kamandi refers to his past, relating all of the crazy stuff the previous authors have put him through, and while the ending is barely a cliffhanger, we can trust that Kamandi didn’t literally die at the end of the story. The metaphor only goes so far. It’s not a coincidence, I am sure, that the characters’ place of imprisonment is a cave, the Platonic symbol of an illusory reality. The various expressions of fear, regret, pride, and acceptance the inmates display are just coping strategies for a situation over which they have no power except in their own attitude. As easy as it may be for prisoners to identify the cell as their entire world, there is clearly something beyond the door in this story, and I have faith that the next authors will give Kamandi a chance to escape. But that’s the problem with faith, isn’t it? By definition it is an expectation without a concrete foundation. I imagine that readers in 1978 had faith that Kamandi would continue to be published after issue no. 59, but the industry-wide collapse that led to the “DC Implosion” and the book’s cancellation put an end to that, much more quickly than anyone could have expected. 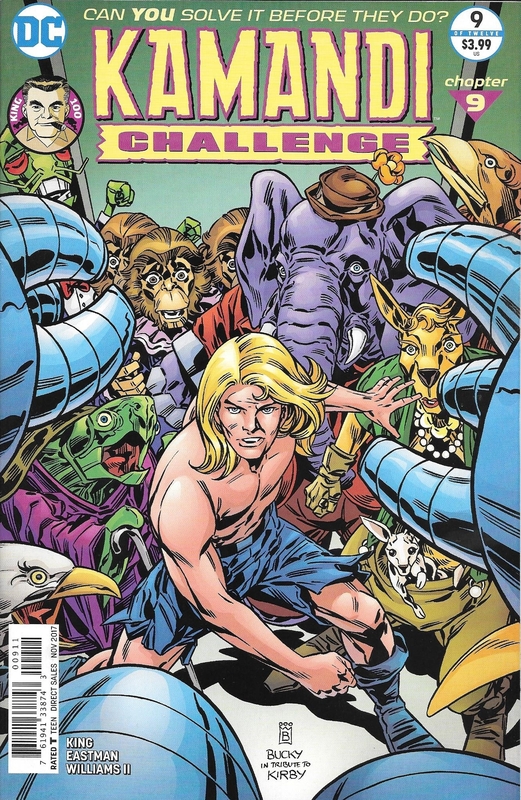 I have faith that I’ll be around in October to read Kamandi Challenge no. 10, but an errant nuclear missile, or a careless driver, or a dislodged blood clot in the wrong place could cut off that possibility. If that happens, then Kamandi’s story will have ended here, at least as far as I’m concerned. “Ain’t It a Drag?” is preceded by a quotation from Blaise Pascal (“I know not whence I came. I know not whither I go.”) and ends with one from Jack Kirby, one that contextualizes Herbert’s search for awesomeness and reinforces the notion that this shadow play is concerned primarily with mortality, with one’s place in the universe and the unknowability of it all. Kirby, who would have turned 100 in August, was most at home balancing the intimacy of character with the sprawling canvas of the cosmos, microcosm and macrocosm, and he rarely favored subtlety. Humanity, to Kirby, is no less powerful and dramatic than the greatest forces in the universe, because those same forces are at home in the hearts and souls of men and women. If King, Eastman, and Williams have distilled the essence of serialized storytelling and of the character Kamandi, they have also placed it in a context befitting the master world-builder and “King of Comics” himself, and touched on the power from which Kirby so liberally drew. In placing Kamandi in a narrative as conceptually audacious and formally inventive as those Kirby himself favored, they have created one of the most powerful tributes to him that I have yet seen in this, his centenary year.